1. Preheat oven to 180 C and line a muffin pan with cupcake liners. Twist the Oreos in half and set aside the extra cookies for later. 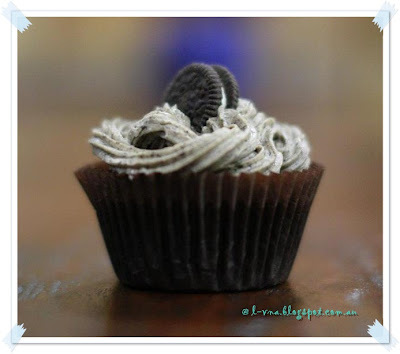 Place the side with cream filling in the bottom of each cupcake liner, cream-side facing up. 2. Place chocolate and cocoa in a medium bowl and pour the hot coffee over the mixture. Whisk until smooth and transfer to the refrigerator to cool completely, 20-30 minutes. Whisk flour, sugar, salt and baking soda together in a medium bowl; set aside. Whisk oil, eggs, vanilla, and vinegar into the cooled chocolate mixture until smooth. Add flour mixture and whisk until batter is smooth. 3. Divide batter evenly among muffin pan cups, filling each 3/4 full. Bake until cupcakes are set and firm to the touch, 17-20 minutes. Allow to cool in pans 10 minutes, then transfer to a wire rack to cool completely before frosting. 4. In the bowl of an electric mixer fitted with paddle attachment, combine butter, sugar, milk and vanilla. Beat until smooth and creamy. Add in the crushed Oreo cookies. Beat for another 1-2 minutes until icing reaches desired consistency. 5. Spoon the mixture into a pastry bag and pipe on top of the cupcakes. 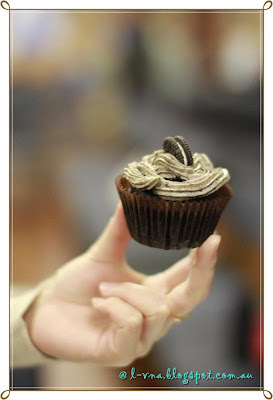 Place the Oreo cookies on top.